I never knew that a whiplash injury would affect me 10 years after the accident. But when I woke up with severe neck pain, unable to move my neck, my life was changed forever! A friend of mine suggested I see a chiropractor, a novel idea to me. So I went for an initial examination and x-rays, which showed a reversal of the normal curve in my neck, a sure sign of whiplash. After a few weeks of treatment, I was feeling 100% better. I was really impressed by this new (to me) kind of doctor. And his staff…they were so caring and helpful and positive about life! Soon thereafter, I began wondering about this treatment that had done so much for me. Why wasn’t it used more often? Why were people so resistant to chiropractic? How did it work? These questions eventually led me to go back to school to become a Doctor of Chiropractic. After considering a number of chiropractic colleges, I chose to attend Parker College of Chiropractic in Dallas, TX. I decided on Parker for a number of reasons. Parker offered a wide variety of chiropractic technique classes. I did not know enough about chiropractic to know about techniques, but I did know that I wanted to learn as much about this approach to health as I possibly could. The handful of chiropractors I knew all highly recommended Parker, as the founder of the college, Dr. Jim Parker, had an excellent reputation in the field as a chiropractor and as a teacher. My family and I were shocked to learn the intensity of the class load, and how comprehensive the curriculum was. 8 months of dissection in anatomy class and another 8 months of dissection class focusing on just the nervous system was challenging and exciting! Here at California Chiropractic, our goal is to determine the cause of a patient’s problem, and, if nervous system interference due to misalignment of vertebra or other bones is the cause, we gently “adjust” the joints to remove the interference. If the problem is not a chiropractic condition, we refer patients to the appropriate medical provider. We find that restoring and maintaining motion in the joints helps to keep symptoms at bay, but more importantly it helps patients live an active lifestyle. Isn’t that why we love living on the Central Coast? Our patients come in all shapes and sizes, from all walks of life, and are at all stages of life, from newborns to Seniors. I am the mother of 3 terrific children. 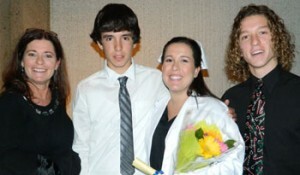 My daughter, Jessica, is in her last year of school on her way to becoming a Registered Nurse. She works in Labor & Delivery at Marian Medical Center in Santa Maria. My son Kyle is a junior at Nipomo High School. He plays water polo, swims and wrestles, and he loves animals. My youngest son, Rick, is a freshman at Nipomo HS. He is the quarterback for the JV football team, and also plays basketball. Besides watching my boys’ sporting events, and getting them to and from practice, I like to garden and work around my home. I love to walk on the beach, and collect seashells and sand dollars. I try to live a healthy lifestyle by eating well (lots of veggies), drinking plenty of water and green tea, and walking a lot. I start each day (to the best of my ability!) with prayer and meditation. I have wonderful friends who share their lives with me, and listen to me as we go through this life with all it’s ups and downs. I get adjusted every 3 weeks. Doing these things keeps me in a Good Place. I have adjusted my children since they were born, and they seem to be healthier than most kids. They have never had ear infections, and have only been on an antibiotic once (or twice, one of them) throughout their childhoods. They did not fuss as babies, and did not stay up all night. But enough about me! How can we help you live a full, satisfying life with the help of today’s safe and natural chiropractic care? Give our Nipomo Chiropractic Office a call so we can help you take your first step towards better health.